As an independent estate agents we are always wanting to be giving the highest level of customer service and have results that prove we are the right choice when selling your property. When you decide to place your property on the market the most important thing in the majority of vendors mind is to do the obvious…sell it! 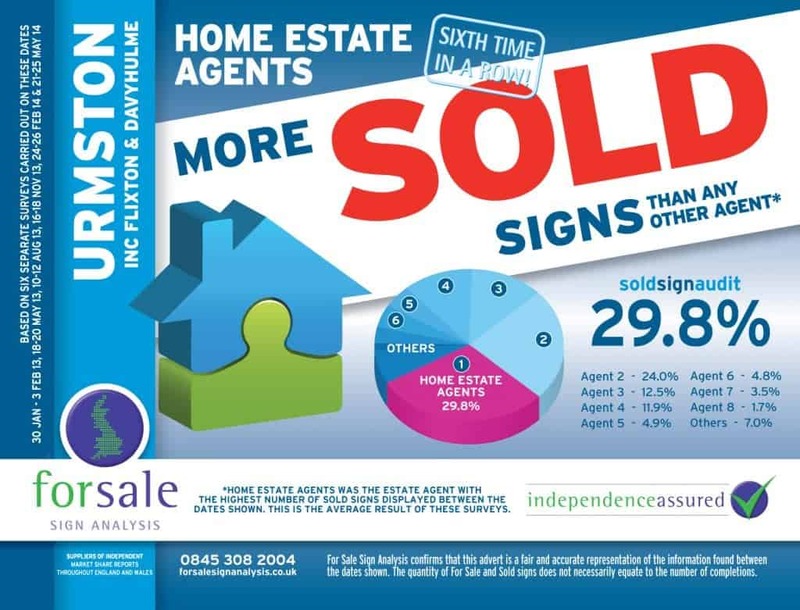 WE OFFICIALLY HAVE MORE SOLD SIGNS THAN ANY OTHER AGENTS WITHIN URMSTON, FLIXTON & DAVYHULME! There are nine agents that operate in the m41 area but with 30.1% of the SOLD signs currently up once again we can boast being the areas leading agent. You may be wondering where this information comes from? Each quarter a company called the For Sale Sign Analysis Group travel around numerous areas within the country collating the information. The only of its type allowed to be used for marketing as its independently verified and the only type leading industry website Rightmove will allow to be used for advertisements. As you may have see from my previous blog last year we achieved an average of 98% of our vendors asking price for their property so not only have we been selling them, we have been doing what everyone wants their agents to do…sell it for as near to the asking price as possible. Are you thinking of moving home within the next 12 months? We would be happy to visit you, discuss with you the current market trends, what marketing we can offer and give you a realistic valuation for your property.